This highly purified osteoconductive material is produced from natural bone through a multi-step purification process. Its natural origin makes InterOss® chemically and structurally comparable to mineralized human bone - nanocrystalline natural apatite. The presence of a macroporous structure favors cell ingrowth, while the micropores allow the penetration of body fluids into the implant. The microporosity can also be used to manipulate resorption and dissolution rate: the greater the microporosity, the greater the degradation rate. 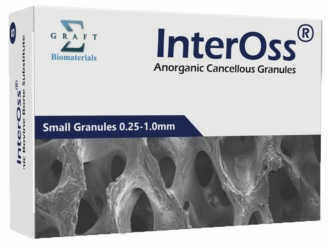 The pore structure and interconnected pore system of InterOss® allow the grafting material to act as a guide for body fluids, growth factors, blood vessel, bone marrow, and bone cells. InterOss® is sterilized using gamma irradiation. Appropriate aseptic technique should be observed in all operations. The package should be inspected prior to use to ensure that the sterile barrier has not been compromised.